Oolong (Wu-long) is a traditional Chinese tea somewhere between green and black in oxidation. It ranges from 10% to 70% oxidation. It is among the most popular types of teas served in typical Chinese restaurants. In Chinese tea culture, semi-oxidized oolong teas are collectively grouped as qingchá (literally "clear tea") . In general Oolong has a taste more akin to green tea than to black tea: it lacks the rosy, sweet aroma of black tea but it likewise does not have the stridently grassy vegetal notes that typify green tea. It is commonly brewed to be strong, with the bitterness leaving a sweet aftertaste. Several sub-varieties of oolong, including those produced in the Wuyi Mountains of northern Fujian and in the central mountains of Taiwan, are among the most famous Chinese teas. One cup of oolong contains approximately 30 milligrams of caffeine. Da Hong Pao Tea is one of the most famous Chinese teas. Belonging to the Oolong category of tea, the tea has a long history and some wonderful legends surrounding it. The English name for the tea is Big Red Robe. 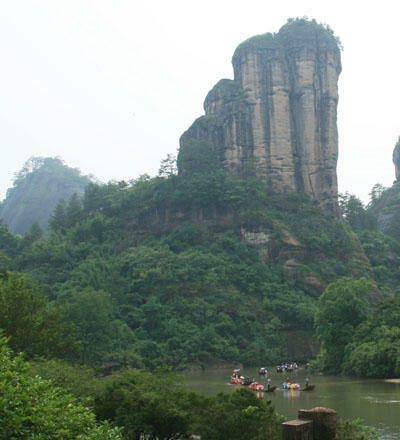 The tea was first produced on Wuyi Mountain in the north of China's Fujian Province. Of the four Oolong Teas which grow on Wuyi Mountain, Da Hong Pao is unquestionably the most famous. The other three are; Tie Luo Han, Bai Ji Guan, and Shui Jin Gui. According to legend, the tea was named after a gift given to the trees from an emperor. During the Ming Dynasty, the emperor's mother was gravely ill. She drank the tea and immediately felt better and was soon cured. The emperor in gratitude for the tea sent large amounts of rare red cloth to cover the trees during winter to insure that they did not die from the cold. The locals then started to call the tree Big Red Robe Tea because of the red cloth. 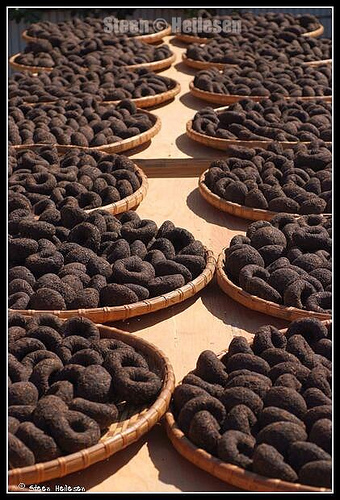 Puerh (also spelled puer, pu-erh) tea is a fermented and aged tea, named after Pu'er county in Yunnan, China. It is an unusual tea, because unlike other teas which are consumed shortly after production, it can be over 50 years old and is usually aged at least 1-4 years. Over this time it acquires an earthy flavor due to fermentation (not the oxidation used for oolong or black teas). This leads to puerh having the unique trait among tea varieties of not losing its qualities after a year or two and of being classified by connoisseurs by year of production. Puer can be made from any of the variety of teas and range from a slightly green herbaceous taste to a darker earthy one and most are pressed into several sizes of bricks, cups and discs. 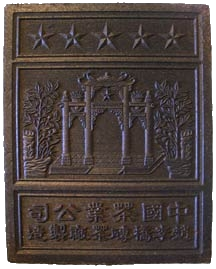 Tea bricks once used as currency were typically made with Pu-erh tea. 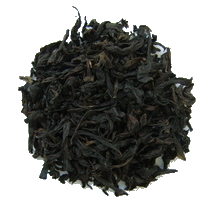 Pu-erh tea can be purchased as either raw (sheng) or ripe (shu), depending on processing method or aging. Sheng pu-erh can be roughly classified on the tea oxidation scale as a green tea, the firing of the leaf is only partial thus allowing the leaf to continue to oxidize slowly over time. Cooked or ripe pu-erhs appear darker due to their initial oxidation before firing and is considered a post-fermented tea. These dark teas age well and their flavor improves with time but the degree of change is less than that of green Pu-erhs.The fact that pu-erh fits in more than one tea type poses some problems for classification. For this reason, the "green tea" aspect of pu-erh is sometimes ignored, and the tea is regarded solely as a post-fermented product. 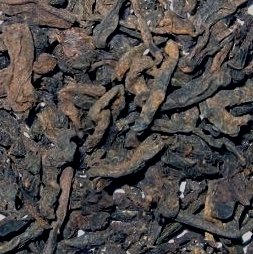 Pu-erh teas are often now classified by year and region of production much like wine vintages. 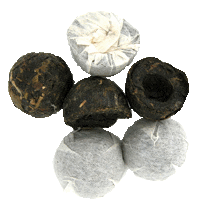 While there are many counterfeit aged pu-erhs on the market, authentic aged pu-erh can be found from trusted sources that is 10 to 50 years old, as well as a few from the late Qing dynasty. Indeed, tea connoisseurs and speculators are willing to pay high prices for older pu-erh, upwards of thousands of dollars per cake. 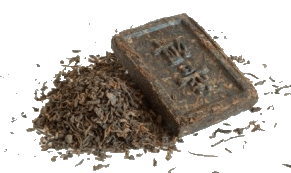 Pu-erh tea is available as loose leaf or as cakes of compacted tea. In Cantonese culture, pu-erh is known as po-lay, bo-lay tea, or bo-nay tea and is often drunk during dim sum meals with family and friends, as it is believed to help with digestion. Puerh is considered a medicinal tea in China. Puerh tea has been subject to a number of health studies. A number of medical studies have substantiated claims that the tea helps reduce cholesterol levels and saturated fats in humans, and that it might also assist in digestion and weight loss. By helping digestion (particularly of fatty foods), puerh is the perfect tea after a heavy meal. For optimum brewing, use boiling water and don't throw the brewed leaves away, you can usually get at least 6 infusions out of a small chunk. You just shave or 'break' off some tea from the brick or disc into your teapot. The flavor of Puerh is often under-appreciated, because it actually gets better with age. Letting it dry age in a cool dark place will improve your cup of tea when the leaves are finally brewed. Made from large-leaf, 4 to 5 year old Pu-Erh Tea in a remote village in the depths of Yunnan Province, China with all the hallmarks of a fine aged Puerh - except the high price. Even though this is an inexpensive Pu-er, aficionados will appreciate this rich, very earthy tea that gets its remarkable flavor from a unique aging process. You can get at least 6 infusions of this hearty tea. This is probably the best tea to drink after a heavy meal, especially with fatty foods. Something every serious tea enthusiast should try. This 'cooked' puerh mini tuocha (pron. toe-cha) is one of the most unique tasting teas we offer and is definitely one of our favorites. These little birds nest cakes are approximately the size of a quarter in diameter and have a strong distinctive earthy flavor. Each tuocha weighs about 5 grams, and are individually wrapped. Each Tuocha makes one cup or pot (plus repeat infusions). The tea can be stored, and will mature over long periods of time. Great for gifts, traveling, commuting, or for any occasion. Aged 12 years (2001). Highly recommended.